Season both sides of brisket with sugar, salt, and pepper to taste. Heat olive oil in a large Dutch oven over medium high heat. Add brisket and brown 5 minutes on each side. Remove from the pan and set aside. Add apples to the pan, and cook 5 minutes or until nicely browned. Stir in thyme and return brisket to the pan. Add apple juice, cover, and bake for 1 ½ to 2 hours, or until tender. Remove brisket and apples from the Dutch oven and let rest. Carefully set the hot pan on the stove and bring liquid to a boil. Simmer for 15 minutes or until reduced by half. Pour into a gravy boat or serving bowl. Slice brisket into ¼-inch thick slices and place on a serving platter. 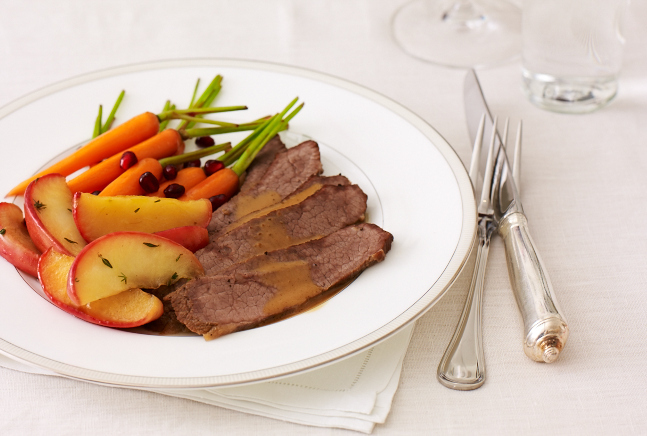 Place cooked apples around brisket and serve with sauce on the side.